Whew, Friday is almost here. 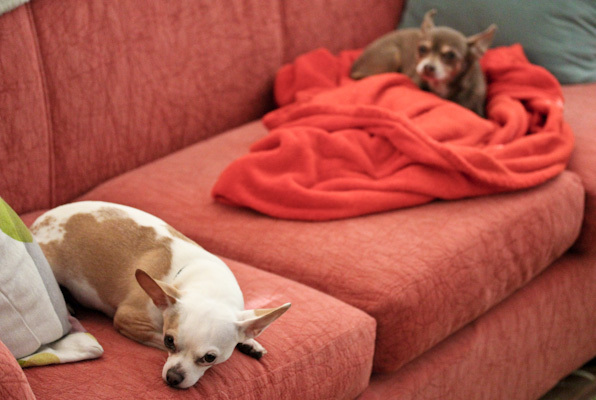 It’s been a busy week, except for the chihuahuas who have been little couch potatoes. I think Leela is pouting at me for not enough walks and attention. I spent all day today at an IT conference which is always a nice break from work for learning and networking. And the vegan options served weren’t bad! I made a huge vegan taco salad plate. And just after I sat down with it, my excited boss who was there too brought me a vegan wrap from another buffet table! I couldn’t turn that down and had a very filling lunch. 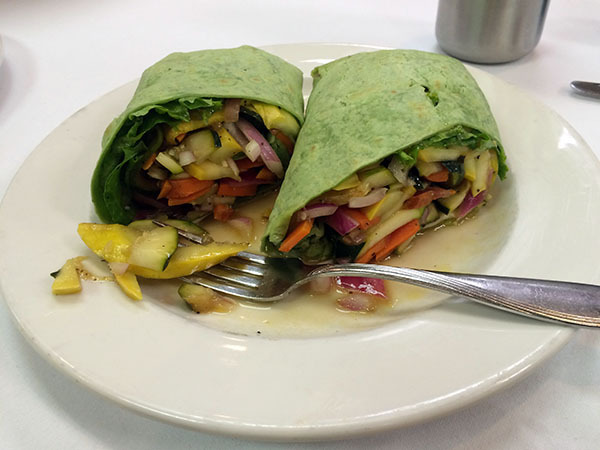 The wrap was so pretty loaded with lots of colorful veggies and it was fresh, not greasy. The taco salad plate was also good, but the veggies, especially the tomatoes, had little to no flavor and were overly chilled. I had a great time chatting with new IT people and sat with a new group of people at lunch. The conversation turned to cancer, always a pleasant topic, because one guy had a terrible history of it in his family losing two sisters and parents to it – poor guy! But it was a good opportunity to steer the conversation in a more positive health direction talking about the Forks Over Knives documentary and Dr. Pam Popper’s free weekly YouTube videos for sorting out the murkiness in health news, this video on cancer statistics is mind blowing! I try to never be that overbearing vegan/healthnut type and never bring up health or diet with new people unless the discussion goes there. I guess I could be more of an activist/advocate for the lifestyle, but that does not come naturally for me and I like to think of myself as more of a silent positive influence. But I also really enjoy talking about healthy living when the conversation goes there and it was great to see new people curious and accepting of the information. Because it’s been a busy week and I’ve been a little drained coming home after work and the gym, I have not been very creative in the kitchen. I was really planning to make a new quinoa recipe or maybe a fabulous raw soup. 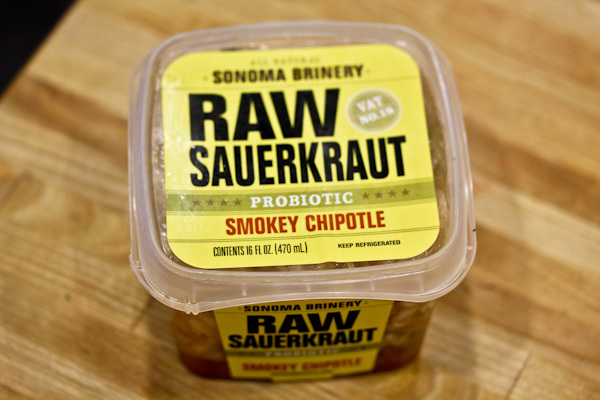 But decided I wasn’t feeling that and went for another salad with my theme ingredient this week – Sonoma Brinery’s Smokey Chipotle Sauerkraut. I scored it on sale at Whole Foods over the weekend and have been obsessed, this stuff is seriously good for a simple ingredient list! 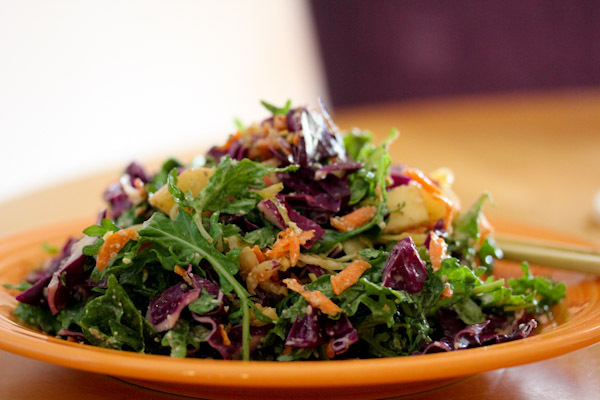 And Dijon mustard is another flavor that works so well with tangy sauerkraut, so I created another simple dressing to coat a kale and sauerkraut salad. Place all ingredients into a blender and blend to a smooth and creamy texture. Serve and enjoy! Makes 2-4 servings. Insanely simple, right? A fabulous simple flavor combo that works so well with sauerkraut! 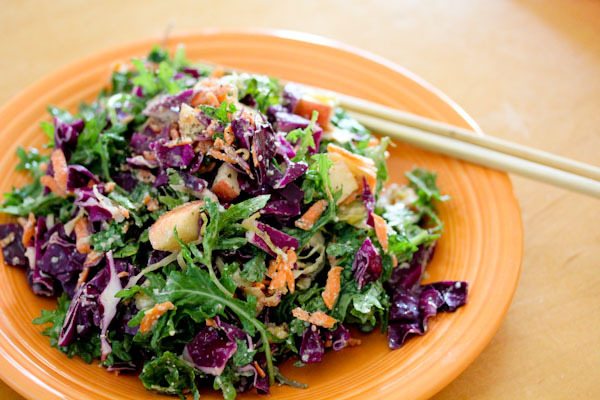 And the salad came out beautifully with chopped apple, cabbage, and shredded carrot, very colorful and visually pleasing. 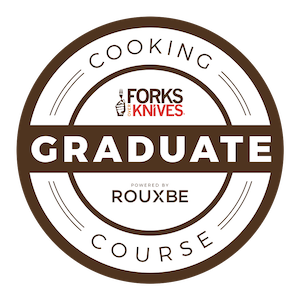 The flavor is wonderful, the dressing has a strong-ish Dijon kick that brings out the smokey chipotle while the sweet apple chunks added a fun flavor and texture. Your boss sounds awesome Christine. I’m like you, I don’t like to be in your face about living a vegan lifestyle. Alex is a little more pushy, but I admire that about her. That salad looks really good. 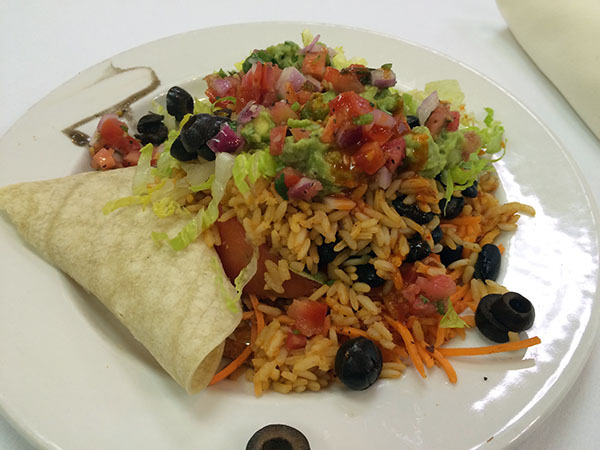 Loving all the wraps and burritos! I have been eating a lot of those as of late, too! 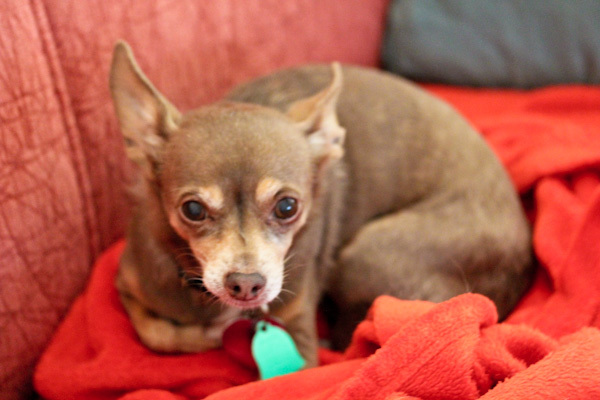 The Chi’s seem to be cute as ever, too! 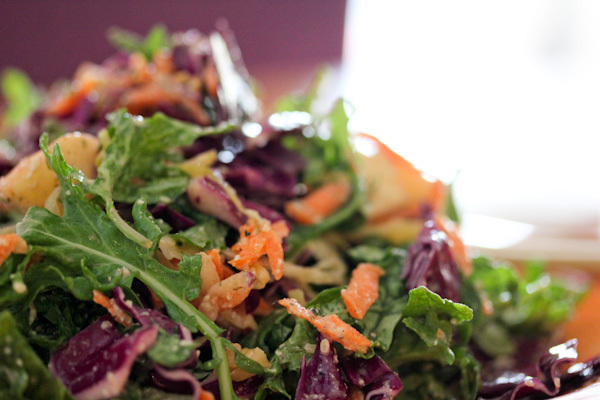 I am totally in awe of the colors in that salad, too! Awesome! Veggie loaded wraps are awesome! 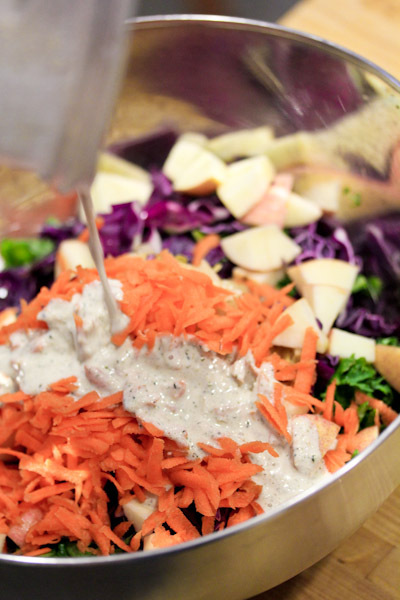 Thanks, fast salads are my easy go tos for busy week nights.